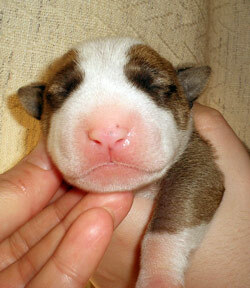 We breed Bull Terriers since 1990. Our first Bull Terrier Joy Pride was of the first bull terriers in Kiev. Now Ukrainian breeders breed Bull Terriers of high international level. I hope that Maggie will take part in development of bull terriers in Ukraine, like her ancestors – champions, interchampions and multichampions in different countries. All our Bull Terriers were our pride, happiness, they were our favourites and members of our families. Now little Bull Terrier Maggie makes us happy. We’ll be happy to answer all your questions. Please write us or fill in feedback form. Please, visit new photo gallery of Bull Terrier Maggie. 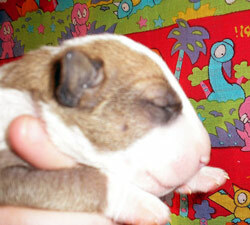 Please, visit video gallery of Bull Terrier Maggie. © Copyright abpridebullterrier.com 2008 Bull Terrier Nord Line Maggie Pride & Joy. All rights reserved.